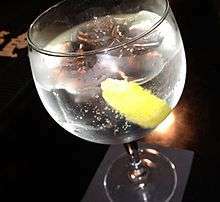 An alcoholic drink, or alcoholic beverage, is a drink that contains a substantial amount of ethanol (informally called alcohol), a depressant which in low doses causes euphoria, reduced anxiety, and sociability and in higher doses causes intoxication (drunkenness), stupor and unconsciousness. Long-term use can lead to alcohol abuse, physical dependence, and alcoholism. Drinking alcohol plays an important social role in many cultures. Most countries have laws regulating their production, sale, and consumption; some countries ban such activities entirely. However, alcoholic drinks are legal in most parts of the world. The global alcoholic drink industry exceeded $1 trillion in 2014. 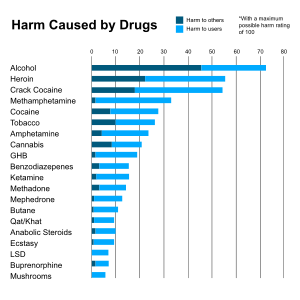 Alcohol is one of the most widely used recreational drugs in the world. For instance, in 2015, among Americans, 89% of adults had consumed alcohol at some point, 70% had drunk it in the last year, and 56% in the last month. Alcoholic drinks are typically divided into three classes—beers, wines, and spirits—and typically contain between 3% and 40% alcohol by volume. Discovery of late Stone Age jugs suggest that intentionally fermented drinks existed at least as early as the Neolithic period (cir. 10,000 BC). Many nonhuman animals also consume alcohol when given the opportunity and are affected in much the same way as humans, although humans are the only species known to produce alcoholic drinks intentionally. 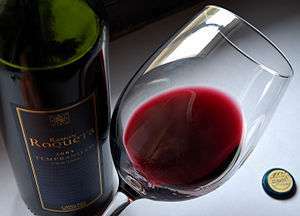 Wine is a fermented beverage produced from grapes. Wine involves a longer fermentation process than beer and also a long aging process (months or years), resulting in an alcohol content of 9%–16% ABV. Sparkling wine can be made by means of a secondary fermentation. "Fruit wines" are made from fruits other than grapes, such as plums, cherries, or apples. Sake is a popular example of "rice wine". Beer is a beverage fermented from grain mash. It is made from barley or a blend of several grains. If the fermented mash is distilled, then the drink is a spirit. Beer is the most consumed alcoholic beverage in the world. Mead (/ˈmiːd/) is an alcoholic drink created by fermenting honey with water, sometimes with various fruits, spices, grains, or hops. The alcoholic content of mead may range from about 8% ABV to more than 20%. The defining characteristic of mead is that the majority of the drink's fermentable sugar is derived from honey. Rectified spirit, also called "neutral grain spirit," is alcohol which has been purified by means of "rectification" (i.e., repeated distillation). The term "neutral" refers to the spirit's lacking the flavor that would have been present if the mash ingredients had been distilled to a lower level of alcoholic purity. Rectified spirit also lacks any flavoring added to it after distillation (as is done, for example, with gin). 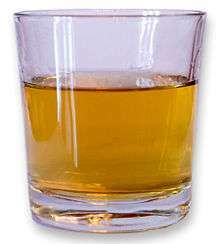 Other kinds of spirits, such as whiskey, are distilled to a lower alcohol percentage in order to preserve the flavor of the mash. Rectified spirit is a clear, colorless, flammable liquid that may contain as much as 95% ABV. It is often used for medicinal purposes. It may be a grain spirit or it may be made from other plants. It is used in mixed drinks, liqueurs, and tinctures, but also as a household solvent. Wine, beer, distilled spirits and other alcoholic drinks contain ethyl alcohol and alcohol consumption has short-term psychological and physiological effects on the user. Different concentrations of alcohol in the human body have different effects on a person. 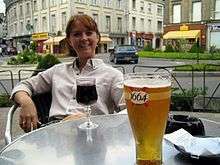 The effects of alcohol depend on the amount an individual has drunk, the percentage of alcohol in the wine, beer or spirits and the timespan that the consumption took place, the amount of food eaten and whether an individual has taken other prescription, over-the-counter or street drugs, among other factors. Drinking enough to cause a blood alcohol concentration (BAC) of 0.03%-0.12% typically causes an overall improvement in mood and possible euphoria, increased self-confidence and sociability, decreased anxiety, a flushed, red appearance in the face and impaired judgment and fine muscle coordination. A BAC of 0.09% to 0.25% causes lethargy, sedation, balance problems and blurred vision. A BAC from 0.18% to 0.30% causes profound confusion, impaired speech (e.g., slurred speech), staggering, dizziness and vomiting. A BAC from 0.25% to 0.40% causes stupor, unconsciousness, anterograde amnesia, vomiting (death may occur due to inhalation of vomit (pulmonary aspiration) while unconscious) and respiratory depression (potentially life-threatening). A BAC from 0.35% to 0.80% causes a coma (unconsciousness), life-threatening respiratory depression and possibly fatal alcohol poisoning. As with all alcoholic drinks, drinking while driving, operating an aircraft or heavy machinery increases the risk of an accident; many countries have penalties against drunk driving. The main active ingredient of wine, beer and distilled spirits is alcohol. Drinking small quantities of alcohol (less than one drink in women and two in men per day) is associated with a decreased risk of heart disease, stroke, diabetes mellitus, and early death. Drinking more than this amount, however, increases the risk of heart disease, high blood pressure, atrial fibrillation, and stroke. The risk is greater in younger people due to binge drinking which may result in violence or accidents. About 3.3 million deaths (5.9% of all deaths) are believed to be due to alcohol each year. Alcoholism reduces a person's life expectancy by around ten years and alcohol use is the third leading cause of early death in the United States. No professional medical association recommends that people who are nondrinkers should start drinking wine. Another long-term effect of alcohol usage, when also used with tobacco products, is alcohol acting as a solvent, which allows harmful chemicals in tobacco to get inside the cells that line the digestive tract. 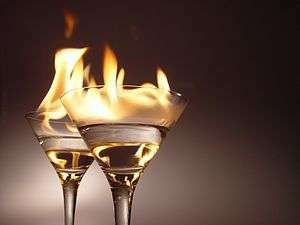 Alcohol slows these cells' healing ability to repair the damage to their DNA caused by the harmful chemicals in tobacco. Alcohol contributes to cancer through this process. An apéritif is any alcoholic beverage usually served before a meal to stimulate the appetite, while a digestif is any alcoholic beverage served after a meal for the purpose of improving digestion. 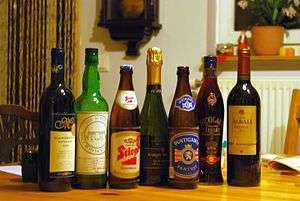 Fortified wine, liqueurs, and dry champagne are common apéritifs. Because apéritifs are served before dining, they are usually dry rather than sweet. Alcoholic drinks are a source of food energy. The USDA uses a figure of 6.93 kilocalories (29.0 kJ) per gram of alcohol (5.47 kcal (22.9 kJ) per ml) for calculating food energy. In addition to alcohol, many alcoholic drinks contain carbohydrates. For example, beer usually contains 10–15 g of carbohydrates (40–60 kcal or 170–250 kJ) per 350 ml (12 US fl oz) which may contribute to an increase in body weight and beer belly. In addition to the direct effect of its caloric content, alcohol is also known to potentiate the insulin response of the human body to glucose, which, in essence, "instructs" the body to convert consumed carbohydrates into fat and to suppress carbohydrate and fat oxidation. Ordinary distillation cannot produce alcohol of more than 95.6% ABV (191.2 proof) because at that point alcohol is an azeotrope with water. A spirit which contains a very high level of alcohol and does not contain any added flavoring is commonly called a neutral spirit. Generally, any distilled alcoholic beverage of 170 US proof or higher is considered to be a neutral spirit. Alcohol laws regulate the manufacture, sale, and consumption of alcoholic drinks. Such laws seek to reduce the health and social effects of their consumption. In particular, alcohol laws specify the legal drinking age, which usually varies between 16 and 25 years, sometimes depending upon the type of drink. Some countries do not have a legal drinking or purchasing age, but most set the minimum age at 18 years. Such laws may take the form of permitting distribution only to licensed stores or monopoly stores, and they are often combined with taxation. 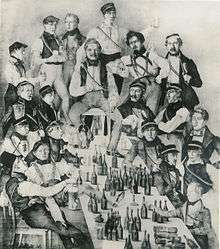 These laws may also limit the hours or days (e.g., "blue laws") on which alcohol may be sold or served, as can also be seen in the "last call" ritual in US and Canadian bars, where bartenders and servers ask patrons to place their last orders for alcohol, due to serving hour cutoff laws. In some countries, alcohol cannot be sold to a person who is already intoxicated. Alcohol laws in many countries prohibit drunk driving. 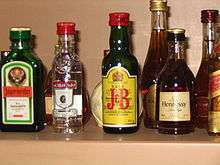 In some jurisdictions, alcoholic drinks are totally prohibited for reasons of religion (e.g., Islamic countries with sharia law) or for reasons of public health and morals (e.g., Prohibition in the United States from 1920 to 1933). In jurisdictions which enforce sharia law, the consumption of alcoholic drinks is an illegal offense, although such laws may exempt non-Muslims. 12th century: Distilled alcoholic drinks were first recorded in Europe in the mid-12th century. By the early 14th century, they had spread throughout the European continent. 1 2 "Minimum Legal Age Limits". IARD.org. International Alliance for Responsible Drinking. Retrieved 23 June 2016. ↑ Charles H, Patrick; Durham, NC (1952). Alcohol, Culture, and Society. Duke University Press (reprint edition by AMS Press, New York, 1970). pp. 26–27. ISBN 9780404049065. ↑ Zielinski, Sarah. "The Alcoholics of the Animal World". Retrieved 2015-07-29. ↑ Martin Dworkin, Stanley Falkow (2006). The Prokaryotes: Proteobacteria: alpha and beta subclasses. Springer. p. 169. Retrieved 29 July 2011. ↑ "Distilled spirit/distilled liquor". Britannica.com. Retrieved 2013-02-05. ↑ Lichine, Alexis. Alexis Lichine's New Encyclopedia of Wines & Spirits (5th edition) (New York: Alfred A. Knopf, 1987), 707–709. ↑ Lichine, Alexis (1987). Alexis Lichine's New Encyclopedia of Wines & Spirits (5th ed.). New York: Alfred A. Knopf. p. 236. ISBN 0-394-56262-3. ↑ Robinson, J., ed. (2006). The Oxford Companion to Wine (3rd ed.). New York: Oxford University Press. p. 279. ISBN 0-19-860990-6. ↑ Caton, S. J.; Ball, M; Ahern, A; Hetherington, M. M. (2004). "Dose-dependent effects of alcohol on appetite and food intake". Physiology & Behavior. 81 (1): 51–8. doi:10.1016/j.physbeh.2003.12.017. PMID 15059684. ↑ Scinska, A; Koros, E; Habrat, B; Kukwa, A; Kostowski, W; Bienkowski, P (2000). "Bitter and sweet components of ethanol taste in humans". Drug and Alcohol Dependence. 60 (2): 199–206. doi:10.1016/s0376-8716(99)00149-0. PMID 10940547. ↑ "The 5 Basic Wine Characteristics - Wine Folly". Wine Folly. Retrieved 6 May 2015. ↑ "Composition of Foods Raw, Processed, Prepared USDA National Nutrient Database for Standard Reference, Release 26 Documentation and User Guide" (PDF). USDA. Aug 2013. p. 14. ↑ Robert Metz; et al. (1969). "Potentiation of the Plasma Insulin Response to Glucose by Prior Administration of Alcohol" (PDF). Diabetes. 18: 517–522. doi:10.2337/diab.18.8.517. ↑ "Ethanol Causes Acute Inhibition of Carbohydrate, Fat, and Protein Oxidation and Insulin Resistance" (PDF). J.Clin.Invest. 81 (4): 1137–45. 1988. doi:10.1172/JCI113428. PMC 329642 . PMID 3280601. ↑ "Find the Alcohol Contents of Beer, Wine, and Liquor". Retrieved 6 May 2015. ↑ Lichine, Alexis. Alexis Lichine's New Encyclopedia of Wines & Spirits (5th edition) (New York: Alfred A. Knopf, 1987), 365. ↑ "fifedirect - Licensing & Regulations - Calling Time on Short Measures!". Fifefire.gov.uk. 2008-07-29. Retrieved 2010-02-11. ↑ Williams, Lizzie. Nigeria: The Bradt Travel Guide. p. 101. ↑ Patrick, Clarence Hodges (1952). Alcohol, Culture, and Society. Durham, NC: Duke University Press (reprint edition by AMS Press, New York, 1970). pp. 26–27. ISBN 9780404049065. ↑ Chrzan, Janet (2013). Alcohol: Social Drinking in Cultural Context. Routledge. p. 13. ISBN 9780415892490. ↑ Forbes, Robert James (1970). A Short History of the Art of Distillation: From the Beginnings up to the Death of Cellier Blumenthal. BRILL. ISBN 978-90-04-00617-1. Retrieved 28 June 2010.